New mortgage rules designed to protect home buyers from over-financing went into effect this month. All insured mortgages (those with less than 20% down) will now have to qualify at a rate approximately 2% higher than the current posted rate of 2.5%. A very similar change will also be applied to all new UNINSURED mortgages (those with 20% deposit or more) beginning January 2018. Meaning that regardless of whether you have 20 or more percent down or not, you will still have to qualify at a higher mortgage rate than the old rules would allow. While this won’t impact your actual borrowing rate, you will have to “prove” that you could handle a mortgage rate increase (an increase of 2 percent) when qualifying for a home. If you do not pass this stress test, you will be left either looking for an unregulated lender who does not have to abide by these new rules, or you will have to consider a smaller mortgage which for most means a smaller purchase all together. While the impact on housing prices is yet to be seen, economists and government regulators are expecting home prices to settle down even further, although a major “crash landing” has been ruled out by many pundits. 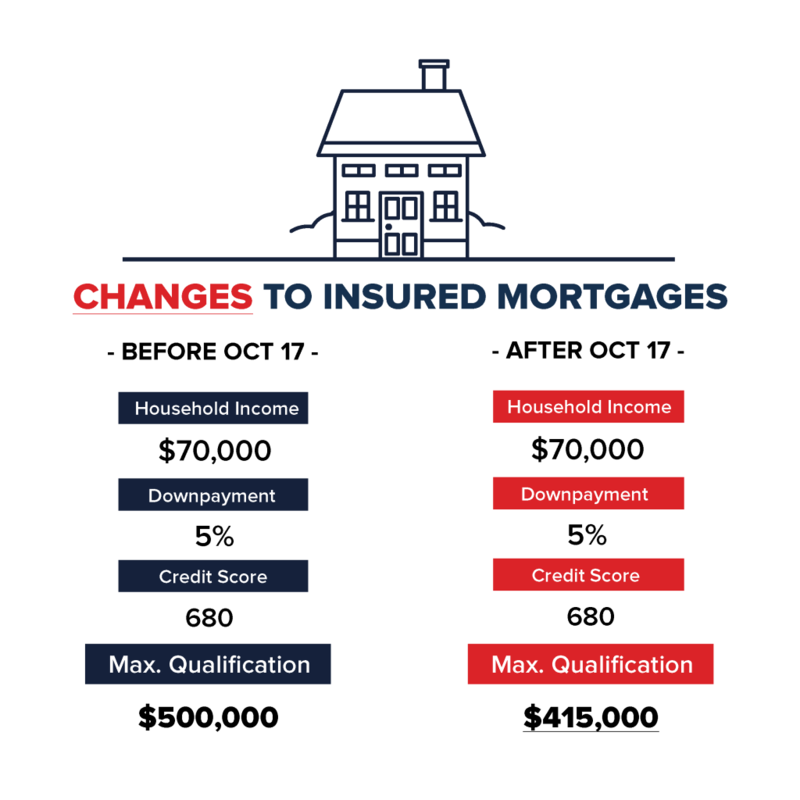 As a final note, it is worth mentioning that these changes will have little to no impact on current home owners who are still paying down their mortgage. The new rules currently only apply to new loans and not existing ones. If you are interested in finding out what your home is currently worth, you can do so using our specialized tool. Or if you are in the market to buy a new property before the new mortgage rules take effect, you can browse through current listings here. And if you would like to find out whether you qualify for a particular home, try your hand at our mortgage calculator. Just remember to set the interest rate at 2% higher than the current borrowing rate to ensure you pass the “stress test”.